German New Medicine (GNM) was created circa 1980 by German MD and professor of biology Dr. Ryke Geer Hamer. It is a new approach to mind-body healing that traces emotional shocks imprinted into the brain that can be seen in brain scans to their exact points of biological impact. Although his energetic mind-body approach started with cancer, eventually it applied to almost all diseased conditions. This unique approach to healing or preventing disease without surgeries or chemicals was a threat to the current modern pharmaceutical monopoly, and its economic model based on the sale of drugs and other pharmaceutical products and services. As a result, medical authorities attacked doctor Hamer, and he spent time in prison prior to his death in 2017. 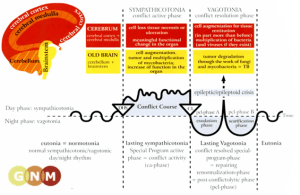 This first article will attempt to introduce this novel healing approach with sources you can reference for greater details to give a basic understanding of how this new approach gets to the root emotional issues behind most diseases whether autoimmune or infectious. Dr. Ryke Geerd Hamer. Image source . The general mind-body concept of Dr. Hamer’s research has been understood before by a few independent observers within the medical field. The difference is that Dr. Hamer has codified and successfully demonstrated his approach by restoring health to terminal cancer patients and others. The results of Dr. Hamer’s work are significant. Dr. Hamer’s life was impacted emotionally by the senseless death from an “accidental” gunshot of his teenage son. Soon after, he was diagnosed with testicular cancer. He wondered if there was a connection to his cancer with the emotional sudden shock of learning of his son’s death. While getting through his bout with cancer he began using his medical background as a practicing physician and medical school professor of biology to research the plausibility of an emotional shock’s connection to the emergence of cancer. His findings are not to be confused with what many consider as psychosomatic-induced illness. With his background as a professor of biology, he was able to the connect a chain of disturbed energy from an unexpected emotional shock in the psyche to the brain while recovering from his cancer and onward after remission. Hamer discovered the psychic-emotional shock’s impact on the brain is observable as a concentric ring pattern that’s visible with CT brain scans. Comparing the CT scans and medical and personal records from the same patients, Dr. Hamer was able to connect the shock’s biological impact. Every emotional shock leaves a shadow on the part of the brain that corresponds to the cancerous body part. Every cancer or cancer-like disease originates with a very difficult, highly acute, dramatic and isolating shock. The psychic shock ultimately creates a biological conflict beyond psychotherapy’s intervention. All these events take place almost simultaneously. This discovery is what mostly constitutes the first of five basic natural laws of the German New Medicine. A summary of the five natural laws details is available here . Future therapies will entail very little medication but will require the patient’s understanding of the root cause of his conflict and disease. Dr. Hamer’s well-documented doctorate thesis to manifest this notion was attacked. The faculty even refused to accept the results of his research. They issued a warning to recant or your contract will not be renewed. Dr. Hamer did not recant. Instead, he continued to research and proselytize  his findings to the medical community throughout Europe regardless of the usual institutional persecution and character assassination. By 1986, the medical authorities in Germany had revoked Dr. Hamer’s medical license. The more Dr. Hamer persisted with his educational campaign to get mainstream medicine to at least test the work that he had scientifically discovered after thousands of hours research, the more the institutional harassment worsened, even leading to imprisonment. Despite the efforts to marginalize him and suppress his discoveries, Dr. Hamer influenced several doctors throughout Italy, France, and Spain. Then he was charged with practicing medicine without a license. Dr. Hammer was extradited to France from Spain where he had been continuing to practice his German New Medicine. Ironically, the international trial that sentenced Hamer to three years imprisonment in 2004, of which he served 18 months, had documented evidence of the efficacy of GNM for cancer. This harsh sentence in the face of positive documentation was clearly a collaboration between the medical mafia and the legal systems of Europe supported by their corporate-funded media. Imagine a brilliant scientist being hunted down throughout Europe for curing cancer, without drugs and surgery, better, more safely, and cheaper than conventional oncology. 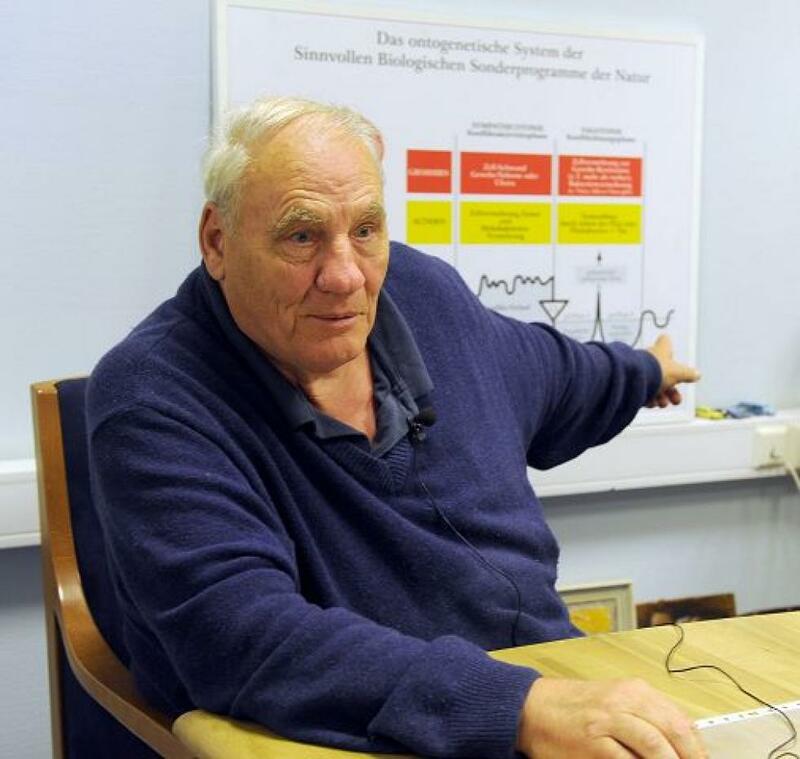 Mainstream oncology and the pharmaceutical industry are protecting their financial interests by ensuring Dr. Hamer’s German New Medicine’s approach to healing a disease doesn’t catch on significantly among medical practitioners and the public. After his early release from prison, Dr. Hamer wrote an open letter to those who were supporting him throughout the legal ordeal. His letter disclosed how the media ignored the fact that even the public prosecutor’s office of Wiener Neustadt privately admitted that documents showed GNM had a remarkable success rate curing cancer. Out of around 6,500 cancer patient cases considered incurable by traditional medical standards then treated under GNM guidelines, over 6,000 went on to thrive after the five years. That’s enough for the medical establishment to consider these patients cured of cancer. By directing our work to the specific moment in time when the conflict shock was experienced and looking for all the possible tracks that prevent the patient from fully recovering, we can have extraordinary results with our clients. Dr. Hamer has carefully correlated specific manifestations of disease with different psychic shocks using brain CT scans to help find the specific emotional root that directly affected a “biological conflict” leading to the disease that is no longer necessary except for extreme cases. Though still useful for determining healing stages and locating triggers to avoid relapse, the brain scans were mostly useful for Dr. Hamer’s research. It’s also not necessary for the GNM consultant to be an MD or naturopathic doctor. It can be anyone trained in the German New Medicine regardless of one’s healing methodology background. But GNM shouldn’t be confused with psychotherapy or any of the new-age approaches for emotional healing to cure physiological diseases that are hit and miss, more often missing than hitting. The trained GNM consultant, armed with a completely mapped out codified system of identifying the emotional root cause of cancer and other diseases, often takes no more than two sessions to find and release the emotional shock that made a biological imprint, thus allowing the body to heal itself with or without other natural treatments. There is a GNM healing center  in Toronto, Canada. Here are some testimonials  from patients who attended there. Sometimes online sessions with this location are available. You can query that here . A chiropractor in the Boston, Massachusetts area, Dr. Neal Robert Smookler, is currently doing well with German New Medicine as well. He advises use for doctors as well as patients who wish to avoid the nastiness of conventional medical treatments and get to the root cause of his or her disease. Here’s a link that introduces him  with contact information that is also from his website .